Eleven countries were visited in five weeks to showcase UK excellence. 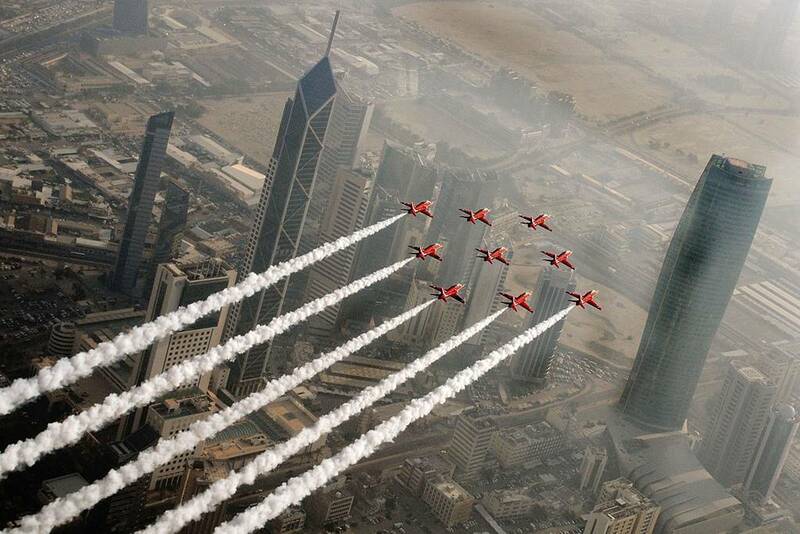 After 8,000 miles, jets from the Royal Air Force Aerobatic Team have returned home from an overseas tour promoting the best of British. The Red Arrows’ distinctive Hawk aircraft arrived at the team’s base of RAF Scampton, Lincolnshire, Oct. 16. The massive overseas tour was announced in August by British Defence Secretary Sir Michael Fallon (More details here). 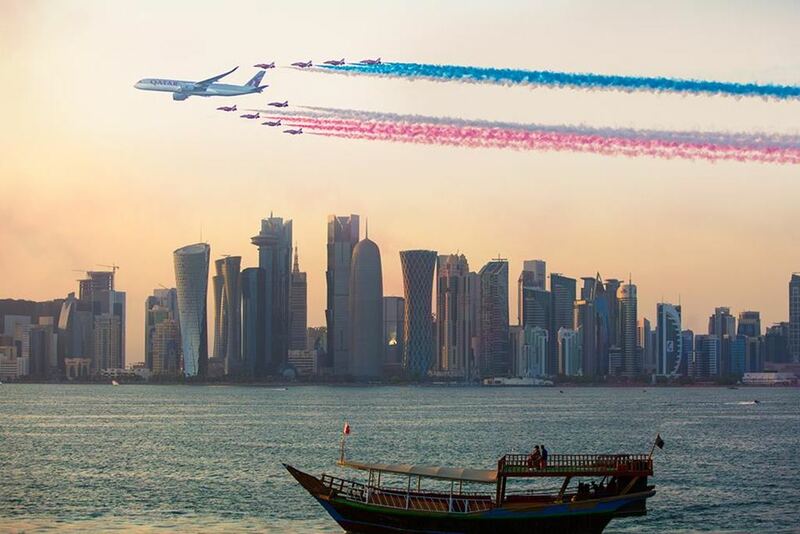 Eleven countries were visited in five weeks, with the world-renowned display team helping to showcase UK excellence in engineering, innovation, creativity and education to millions of people. 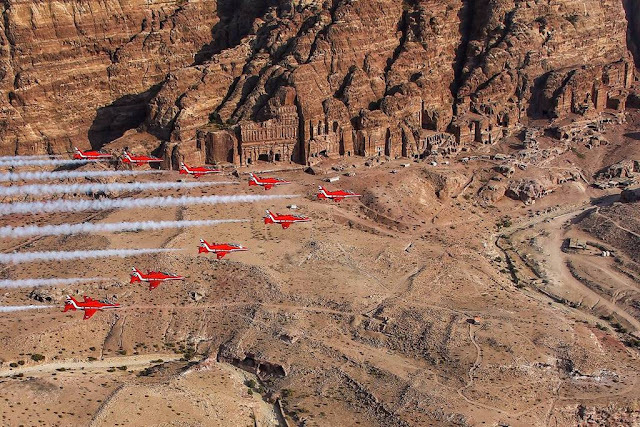 At the end of the planned show around Europe, the Team flew to Jordan where it completed flypasts over eight national landmarks, including Petra. The first display in Saudi Arabia by the Red Arrows in a decade was then staged in Jeddah, to help mark the Kingdom’s National Day, before a move to Kuwait – only the third time the team has performed there. Doha’s skyscraper-lined Corniche provided the next venue for a display and also a special mixed formation flypast with a Qatar Airways Airbus A350, celebrating the airline’s 20th anniversary and also highlighting the airliner’s British-made Rolls-Royce engines and wings. Muscat, Oman, was the sixth show location and then the team performed in Karachi – the first time the Red Arrows had displayed in Pakistan for 20 years. The last public display of the deployment and the 2017 season was in Bahrain, against a perfect blue sky. 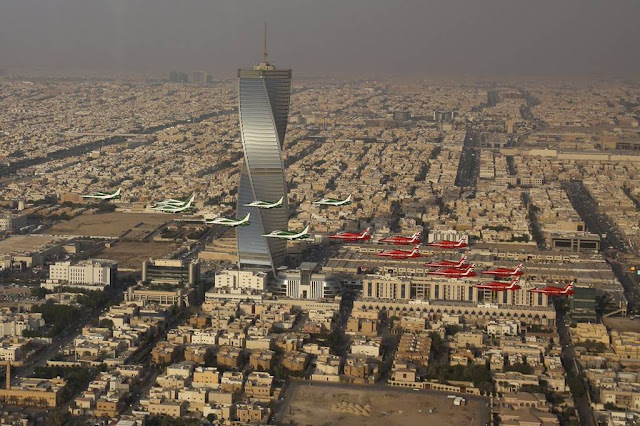 Before returning home the Red Arrows flew with the Royal Saudi Air Force Aerobatic Team, the Saudi Hawks, carrying 16 Hawks aircraft in the sky over Riyadh.